Serena sits outside with a drink and Sky comes along wondering if she's seen Boyd. Serena just looks guiltily at her and Sky says, “that he isn't coming, is he?” Serena still can't answer back so Sky thinks Boyd has sent Serena to tell her he isn't coming. Yet again she doesn't speak so a disappointed and annoyed Sky wishes she hadn't bothered turning up and turns to leave. Serena now finds her voice but it is too late as Sky leaves. Toadie is on the phone telling Angie he is too busy to come up for Christmas. He enters the livingroom and comments to Connor that he likes the decoration since they are beer cans. Stingray comes in wanting him to go out with him but Toadie knocks him back as he's busy. Toadie wonders why Stingray is down, and correctly guesses it is because of Serena. Stingray wonders when they are going to Angie's until Toadie tells him he's too busy but they will do something here instead. Stingray cheers up when Toadie tells him what food they will be having (all his favourites). Stu comes in all dressed up for the Rotary award ceremony and they all decide to go along to support him. Everyone is waiting around for the ceremony to begin when Sindi comes in. Connor wants to know why she is here and Toadie tells him he phoned her. 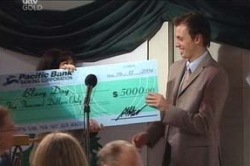 Stuart receives his award and makes a speech constantly looking at Sindi. The host comments after Stu's speech if he has a “lady friend” watching and he replies that at present doesn't have a lady friend. Sindi looks like she's ready to kill him! Harold asks Serena if she knows where Sky is as she is overdue but Serena says she doesn't. Lana calls round looking for Sky. She tells Serena about received a confusing text message from Sky and when she tried to call her, phone was switched off. All Serena can say is “weird” so Lana wants to know what is going on. Serena tells her that she's done something terrible and unforgivable. Everyone is congratulating Stu but he tells them all to move on as it is becoming boring now. As a diversion, they instead talk about a case Toadie is working on. Stingray starts choking on some canapés, so Toadie takes him away for a drink. Connor and Carmella leave too, which leaves just Stuart and Sindi but not for long but Sindi thinks people will notice if they leave together. STU: Well not if we slip away separately, you with a headache and me with chronic shyness. SINDI: Meet you at my place in ten minutes and don't be late. A teary Serena has told Lana the full story of what she did. Lana says that Sky and Boyd are the perfect couple and that they are meant for each other before adding that deep down she knows that too. Serena tells her she just wants someone who is right for her and Lana tells her she will one day but she's got to sort this right. Stuart has now arrived and they slowly head towards her bedroom…until they hear Stingray, so they quickly feign their innocence. Stingray wonders what they're doing here. Sindi quickly says nothing before making up a cover story but he doesn't believe them, as he saw them kissing earlier. Stu tries to deny anything is going on but Stingray accuses them of going behind Toadie's back. Stu denies that, saying he wouldn't do that to a mate and Sindi also confirms that there is nothing going on. Stingray leaves to walk Audrey and they wistfully look at each other. It's Christmas Day and everyone is opening their presents – they've all got water pistols, as David discovered it is the only legal way to keep the lawn watered! Lil calls Serena over but she is sending someone a text message, saying ‘meet me outside in five minutes'. Harold tells them he is glad they're all together to share Christmas with each other and Lil wishes that Luka were here. 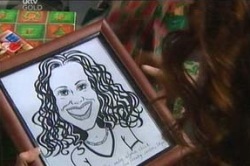 Sky gives Serena her present – a caricature of herself. Serena says that Sky's present is outside and they head out to get it. David after filling up his water pistol starts to soak Lil and Harold. Sky is wondering what she has got from Serena as they walk along they pavement and promptly run into Boyd! Sky and Boyd obviously don't want to be near each other and begin walking away until Serena stops them and tells them they are meant to be together. After standing their ground for a few seconds Boyd suggests going for a walk which Sky accepts. Boyd and Sky have walked…to her car where they're kissing and making up. The scene cuts to someone driving away Sindi's car, which she has just sold. Stu of course, is gloating to her that she should have listened to him in the first place. They spot David and Lil soaking each other with their water pistols and Stu hopes they are legal! Serena and Harold come out and join in the soaking before he leaves to check on TCS. Toadie comes out and wishes Stu a Merry Christmas. Stu returns it and tells him he has just helped Sindi sell her car. Sindi asks Stu if Toadie knows and he says that if he does know, he hasn't said anything. Stuart wonders why can't they just tell him but Sindi replies they can't do that on Christmas Day. David comes back into shot and promptly soaks Sindi with his gun, and judging by the look on her face the water must have been very cold! Harold has now arrived at TCS and gives Lana a present and thanks her for working on Christmas day. Harold spots a depressed Stingray at the counter – Toadie is busy working and Susan is at Libby's – so he invites him round to No. 24 for Christmas food. Stingray wants to know what Serena though of his present and Harold says he doesn't know so Stingray turns down his invitation. David and his water pistol have now reached TCS, and drenches Harold again. Harry hasn't got his gun, so chases after him with a full glass of liquid instead. Lana comes over to Stingray and says that David & Harold have finally gone insane. Stingray tells her he's now in the mood for some mischief making himself, and she wonders what it is. The scene quickly cuts to Lana and Stingray about to spray paint ‘peace' on the road. David and his trusty water pistol come out so Stingray distracts him whilst Lana does the spraying. David is now soaking Stuart and Connor inside No. 30 until they eventually get rid of him. Carmella comes in with presents for them. Stu brings some beer in and wonders where Toadie is. At the mention of beer, Toadie comes in and Connor and Carmella make a subtle exit. Stu tries to tell Toadie about his relationship with Sindi but Toadie stops him and tells him about Tim dropping him from the big case he's been working on. Toadie now wonders what Stu wanted to talk to him about but he says it wasn't important. Harold volunteers to do the dishes since David is still playing with his toys! Lil goes to help him and Serena gives Sky her real present. Sky tells Serena still has one present left to open – her present from Stingray. She opens it and there is a written message, ‘my frog wants to talk to your frog.' Serena and Sky twig it is from when he asked her out for the first time before Sky adds that he obviously wants her back pretty bad and that she should go for it. Stu is on the phone telling Sindi about Tim Collins kicking Toadie off the big case. Sindi is upset for him and asks if he got the chance to tell Toadie about them. Stuart says no since he didn't want to kick him twice today. Toadie comes in and gives Stu a beer so he quickly hangs up. Toadie wants to know who he was talking to. He lies saying it was work.